"1 to 2.7 Billion" was a precise scale model of the solar system. It cast the viewer as an interplanetary space traveler moving from one world to the next, walking at a speed of roughly 8 billion miles per hour, or more than ten-times the speed of light. The project consisted of ten installations spread across nearly two miles of arid desert. The vast scale of the Black Rock Playa was ideally suited to illustrating the immensity of space standing between one tiny world and the next. The installations themselves were designed to communicate how isolated each planet truly is. For example, the Earth, our home and everything we know, was represented by an object a mere 4.5mm in diameter, yet located almost 200 feet from the sun. 1:2.7B was designed to inspire viewers to re-examine their concept of scale and contemplate their true place in the universe. Each installation consisted of a small sculpture designed to highlight the character of the planet being represented. A light shone from the sculpture onto the tiny planet model in the direction of the sun's illumination. Each planet was also highlighted with a continuous loop of original ambient music produced by various project contributors. 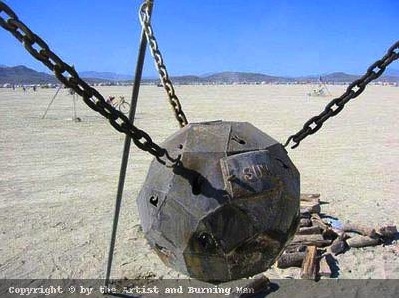 The sun contained a wood fire that was kept burning nightly, and an event was held wherein participants could create paper representations of things they'd like to be rid of, and "launch them into the sun." 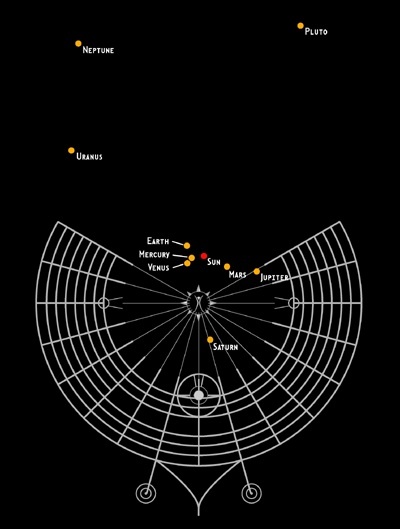 The planets were placed using GPS in a layout congruent to their actual positions on the planetary plane during the weeklong installation period. At the time, it was the world's second largest solar system model. This project was produced in collaboration with E. Morley John.